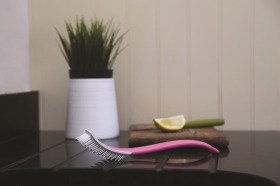 Dishmatic Glide is a dish brush that has been reinvented for easy and efficient washing up. It’s perfect for adding a bit of glam to your kitchen sink with its sleek, curved appearance, says the company. Available in fresh white, bold pink and calming blue, it not only looks the part but acts it too. Thanks to the innovative staggered bristles, Dishmatic Glide goes beyond standard levels of dish brush hygiene. Food residue is less likely to get trapped, and to wash the brush, simply rinse it in water or pop it in the dishwasher.